In a classical example of maybe-legal but still atrocious 'soft corruption', this article looks at a recent email sent around to a group of industry lobbyists offering them tickets to sit with to congressional big wigs at the grammies for a steal at just $5k a pop. We've talked a lot in the past about the concept of soft corruption. These are the kinds of practices that are most likely legal, and possibly even common among the political class, but which absolutely stink of corruption to the average American. And that's a huge problem, not just because of the general ethical questions raised by such soft corruption, but because it creates a cynical American public that does not trust politicians to adequately represent their interests. Tickets are $5,000 each. If you need a second ticket then please let me know and I will put you in touch with Yuichi Miyamoto from Ranking Member Nadler's team. Please let me know as soon as possible if you want to attend since we have a limited number of spots. We also request that you use the room block for the stay. 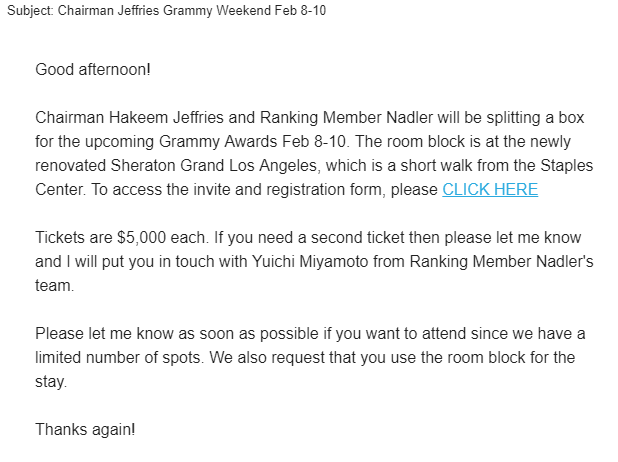 The link then takes people to an official invite to hang out with Reps. Jeffries and Nadler at the Grammies. Just $5 grand a pop. They'll even book your hotel for you! What a deal! What a steal! Jeffries and Nadler are both bigshots in Congress. Jeffries (who originally ran for Congress stating: "Washington is broken. Congress is dysfunctional.... We deserve more") was just elected to be the chair of the Democratic Caucus, which makes him an incredibly powerful Congressman. Nadler is the current "Ranking Member" on the powerful Judciary Committee, and once the new Congress begins, will become the Chair of the Judiciary Committee -- the very committee in Congress that is in charge of copyright law. Nadler has a long history of pushing horrific anti-public copyright bills. Back in 2012, he proposed what I jokingly referred to as the RIAA Bailout Act of 2012, as the entire point of the bill was to drastically increase the rates internet radio would have to pay the record labels. He's also mocked digital rights activists, by calling the idea that "you bought it, you own it" was "an extreme digital view." So, it certainly does seem notable that both of these Congressional Reps (1) have "a box" at the Grammies and (2) they're actively asking industry lobbyists to give them $5,000 per ticket to hang out with the Congressmen at the Grammies. Again, some may suggest that this is "how fundraising is done" in Congress (though, frankly, it's usually a bit less blatant). 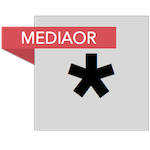 But, even so, is this how it should be done? Doesn't anyone in Jeffries' or Nadler's office think that going to a key recording industry event and asking the industry's biggest companies to pay them $5k to spend some time with them... looks really, really bad? And, relatedly, how the hell can we trust that the various copyright bills that are certain to be under Nadler's control over the next two years (at least) are actually written for the benefit of the public, as per the Constitutional requirement, rather than the benefit of his $5,000 paying "friends" who hang out with him at the biggest celebration of the industry over which Nadler gets to set key rules? In the past, there have been ethical questions raised by Congressional Representatives hosting fundraisers targeting industries they have jurisdiction over regulating, but these things tend to get swept under the rug in Congress as part of "the way things are done." But, it certainly stinks of the kind of "soft corruption" that makes the public distrust the government. Indeed, it's the kind of thing that makes people say: "Washington is broken. Congress is dysfunctional.... We deserve more."